Does your kid wait by the mailbox every day, hoping it's the day she finally gets her acceptance letter from Hogwarts? That's a trick question, since she knows that the letter could just as easily come down the chimney, or out of a furnace vent, or even get delivered by owl. But you know she'll have a blast practicing her spellcraft in this official Hermione Granger Costume while she waits! Okay, we know that Hogwarts is just a fantasy and nobody actually gets letters from them (trust us, we waited for a long time before finally accepting it), but it's still so cool to think about! Who wouldn't want to take that first step onto Platform 9 and 3/4, hop aboard the Hogwarts Express, and get whisked off to a school of witchcraft and wizardry!?!? And out of all the students from Hogwarts to model after, you really can't get any better than Hermione. She's brave, smart, and bloody clever in a pinch, and even though her pal Harry always gets the spotlight, it's usually Hermione that makes his incredible exploits possible. After all, who else could brew a batch of polyjuice potion in the bathroom on short notice? Your little girl is going to feel just like Ms. Granger herself in this awesome Hogwarts-style witch's robe for Halloween! It's officially licensed, so she'll look like she's a real student from House Gryffindor in the movies. 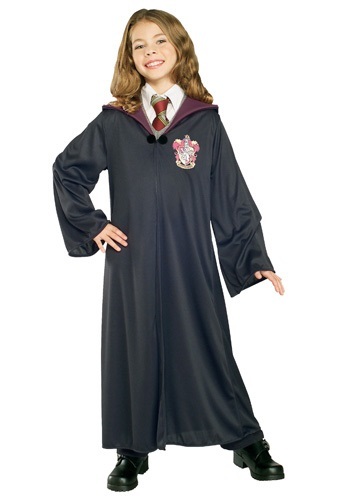 Be sure to get a Gryffindor necktie to go with the robe, and she'll be all ready for her witchcraft career to begin! 6 year old daughter loved it. It held up through school parade and Halloween night with no damage to it. My daughter was super excited for the costume, but upon arrival the seams had already come undone. There was a huge hole in the armpit and the bottom seam was unraveling. I guess you get what you pay for but I at least expect it to be sewn properly.